If you have made it to the interview you should assume that you and they (the organisation) think you are qualified to do the role. But being qualified and experienced enough to do the role does not guarantee an appointment. In fact, over and over again I have sat in board interviews and seen how the most qualified candidates stumble during board interviews. This primarily occurs due to a lack of preparation. Specifically, they simply failed to show the organisation why they stand out from other equally qualified candidates and did not 'dare them not to appoint them'. Every board interview is different. Some are formal (with the whole board) and some are done in a coffee shop (with just the Chair or consultant). It does not matter what form your interview will take, your board interview preparation is of utmost importance. Regardless of the type of interview, most consider it to be a situation where you are at the disposal of the interviewers. This is often the case but it needn’t be. If you are clear about what it is you can offer and know your Unique Selling Point, then you can begin to guide the interview towards the message you want to deliver. It is important for you to do this carefully and appropriately. You should always answer the question posed to you directly. Nonetheless, you know why you should be appointed to the board, so it is important for you to not leave the interview without having clearly stated your value. Doing so will result in an interview that will reflect what you offer. If you do all this, you should find the interview fairly easy. That is not to say you will necessarily get the position; after all, you don’t know who else they are seeing. But you will have been able to best represent yourself and how you can help them achieve their goals. This information is usually given to you by the recruiting organisation – though not always. It is essential, however, that you ask whom you will be seeing. Most of the time it will be the Chair, but it could also include other board members - perhaps the CEO, a recruiter or an HR specialist. Knowing whom you will be interviewed by, means that you can research them. You should consider not only their role on the board or in relation to the organisation, but also where else they might be a board member, what they have done before, what their interests are and, importantly, what commonalities you have – including who you might know in common. Once you have this information it is far easier to demonstrate that you are an informed candidate and also to strike up a rapport. Here it is important to remember the fifth element of what Chairs look for – cultural fit. That is, that they want people they know and trust. Showing commonalties is a great way to do this and flatter them during the process - this never goes astray. In this case, researching the role means understanding what your contribution will be in response to what it is they desire from the new appointment. You must be able to clearly articulate this information based on your previous research of not only their organisation but also in speaking with stakeholders and competitors and through your on the ground research. I focus on research a lot not only because this is the element that will make the interview plain sailing but also because it can be leveraged into new opportunities. With this in mind, you should reach out to the initial connections that you used in your personal research. The purpose is to both update them on your progress and impress them by telling them that you are in the final throws of gaining an appointment. Hopefully, in doing this, you will be able to garner new information and also leave them with the impression that you offer value – a value that has now been confirmed in their minds because of your invitation to a board interview. You can further impress them by referencing the other research conversations you have had with their stakeholders. What sort of interview it will be – for example, will it be technical, informal or a panel of interviewers? Forewarned is forearmed in this case, so getting as much information as you can up front is valuable – you will feel comfortable in the interview and know what to expect. It might sound a little clichéd, but I recommend to all my members that they use the TEE approach when answering questions. Doing so means that you will keep your responses on track. If interviews make you nervous, I find working to a format makes things easier. The technical response would be to list your past or current NED experience. Simply stating this would make you a C candidate. The next element of your answer would be to give examples of what you did in these roles – perhaps you sat on subcommittees or were involved in a particular element of the business. Giving examples would make you a B candidates - along with many others. Finally, you should provide some evidence of success – what decisions you were part of, what the board or organisation was like when you first started on the board and what it is like now, or what particular strategic changes you brought about. This sort of response will make you an A candidates - a top 10% candidate. Board interviews can be intimidating - even having done your research. However, using the advice and structure above should provide you some comfort. 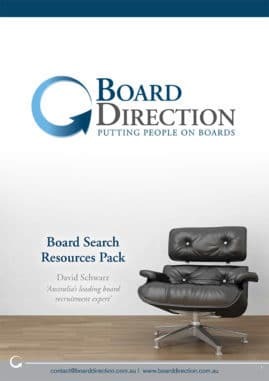 I have conducted thousands of board interviews in my time and have coached hundreds to have successful candidates. Despite this I am constantly surprised (though shouldn't be) the difference that conducting a mock board interview can make on the confidence and effectiveness of a interviewee. 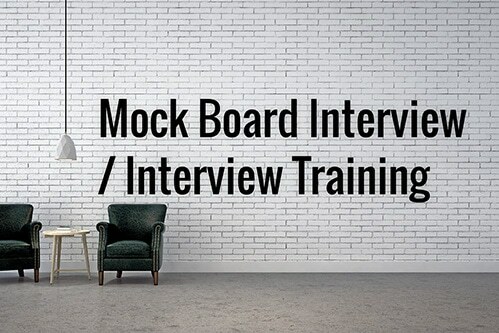 So, whether you do it with me or with someone else you trust preparing and practicing for a board interview is perhaps the most important thing to do prior to the actual interview itself.